Leading Manufacturer of s.s. chain pulley block- 0.8t x 3mtrs lift and stainless steel chain pulley block from Mumbai. 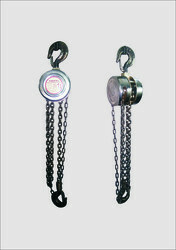 With the assistance of our team members, we have been able to offer superior grade S.S. Chain Pulley Block. These blocks are manufactured in adherence with international standards and norms using optimum quality raw material and sophisticated machines. We offer these blocks in various specifications to meet the variegated requirements of our clients. Stainless Steel Chain pulley Blocks with all parts in S.S. 304 construction. We are the prominent manufacturers of a vast collection of Stainless Steel Chain Pulley Block which are demanded by Chemical Pharmaceutical industries as per international standards. These are made with good quality stainless steel materials, are corrosion proof having a long lasting esthetically good look and are highly appreciated for its durable nature. Our collection of these steel chain pulleys is extensively used in various heavy duty applications in different industries. Clients can avail these at competitive prices.